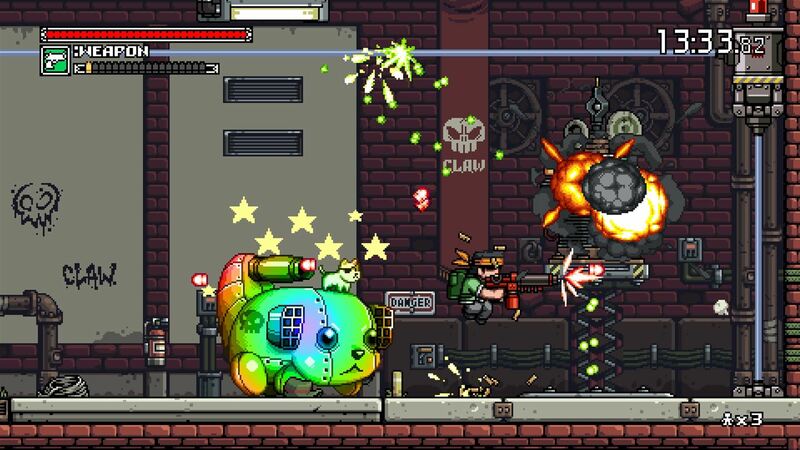 With great sprite graphics, an awesome retro soundtrack, and satisfying arcade-style run and gun gameplay – Mercenary Kings has pretty much everything oldschool 2D action shooter fans could ask for. Part Metal Slug, part Metal Gear, Mercenary Kings wears its inspirations on its sleeve but turns it all into a very fun and satisfying whole. Continue reading our full review of Mercenary Kings: Reloaded Edition for all of the details. History lesson time. Mercenary Kings originally launched on PS4 in April 2014. Nearly four years later it has been given a “Reloaded Edition” update and, more importantly, is available on Xbox One and Nintendo Switch for the first time. If you already own the PS4 version the game will update to the Reloaded Edition for free. The Reloaded Edition adds two new characters, some extra missions, more custom weapons, and some quality of life and performance improvements. Xbox One and Switch owners get the best version of the game, the Reloaded Edition release, right off the bat, so I guess your patience has been rewarded. 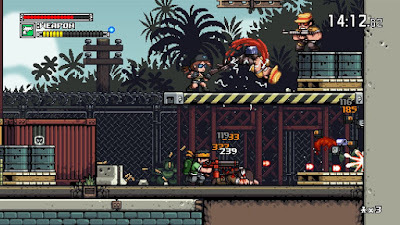 Mercenary Kings is a 2D side scrolling shooter / platformer that looks and feels an awful lot like the Metal Slug series, but there are quite a few key differences. The gameplay generally isn’t as hectic as Metal Slug, for one, as the game typically doesn’t throw a ton of enemies at you at once. There are several enemy types, each with different weaknesses and patterns, and carefully and calmly ducking to avoid shots and then popping up to fire when the time is right is generally the name of the game here rather than wildly running and gunning. 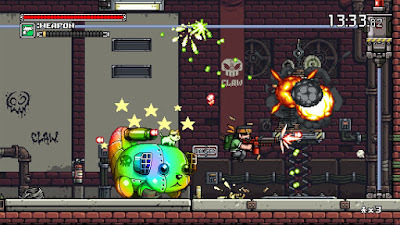 Mercenary Kings isn’t a linear left to right shooter, either, as the levels are large and open and meant to be explored. You’ll need to thoroughly explore, too, in order to find materials to use in the game’s extensive crafting system. I know, I know, “crafting system” is almost a bad word these days as far too many games implement clumsy crafting mechanics, but Mercenary Kings does a good job with it. You are able to Frankenstein a bunch of different gun parts together in order to create fully customized weapons with unique attributes and it is pretty crazy how powerful you can get by the end of the game. You also have a customizable melee weapon, too, that can be anything from a normal knife to a pizza cutter, plunger, fish, and much more. You also use your collected materials to upgrade your armor (to give you more HP) and can build body mods that make you more lucky (to find more materials), recharge HP faster, and much more. The crafting and customization is a well done and surprisingly addictive carrot that keeps you coming back in Mercenary Kings. One key addition in the Reloaded Edition is the ability to simply buy rare materials if you missed picking them up in a previous mission, which is a huge help and means you don’t have to replay missions over and over to grind materials quite as much as you did in the vanilla game. Something else that sets Mercenary Kings apart is its health system and radio transceiver. You can actually take quite a few hits in Mercenary Kings, but when you run low on health you need to either use a med kit or ration item, or wait it out in an infirmary building (the enemies let you use their medical supplies, I guess) where you health will slowly refill. When you’re in a pinch you can also use your radio to talk to your allies at base camp, Metal Gear Solid-style, who can help you with what to do next, teleport you back to the beginning area of the map, or even drop health kits and other supplies when you need them. Getting help like this can only be done a handful of times per mission, however, so you have to use it wisely. My only real complaint with Mercenary Kings is that the missions get pretty repetitive fairly fast. Even though your mission objectives may vary from killing specific enemies to beating a boss or simply collecting items, they all end up feeling pretty much the same. There are only a handful of maps to explore and backtracking back and forth across them over and over and over again gets old pretty quickly. Re-playing missions with different weapons or taking different paths through the level or attempting speed runs do give it some variety, but generally speaking the missions are pretty repetitive. With that said, however, the game definitely does ratchet up and get more interesting the deeper into it you get. The enemies get more varied, certainly, and the customization options you have keep getting more and more wild. It takes quite a while to get there, though, as Mercenary Kings is kind of ridiculously huge. There are well over 100 missions in the game – each one takes between 5-30 minutes to complete – so there is a ton to do here. Your first several hours are kind of a slog, but once you break through things get better. I definitely wish there were more maps and more mission variety, though. You can play through the game solo or in up to four person co-op, either online or locally. Co-op is a total blast and definitely the recommended way to play. The game costs $20, which seems somewhat steep (especially since the game has been on sale pretty much constantly on PSN) but you do get a ton of content and dozens of hours of playtime for the price. The presentation in Mercenary Kings is very, very appealing with very sharp and attractive pixel art that looks fantastic. The sound is also very well done with great oldschool arcade shooter effects and a phenomenal soundtrack. Overall, Mercenary Kings: Reloaded Edition is a pretty fantastic 2D arcade shooter throwback that is pretty easy to recommend. It does stumble a bit with repetitive mission design, but the core gameplay is solid, the co-op is great, the customization is addictive, and the presentation is pure oldschool bliss. 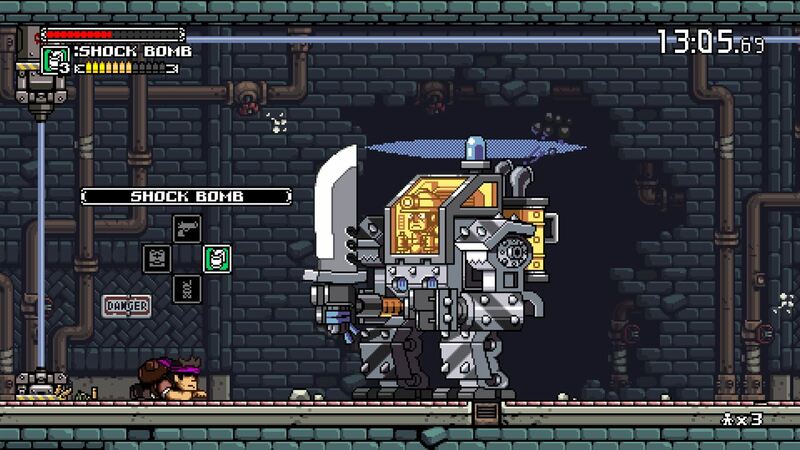 Mercenary Kings: Reloaded Edition is a ton of fun. Buy it.